Key Difference: Drones are semi-autonomous vehicles that are attached to a larger spacecraft, and are designed to expand the ship's launching capabilities. A robot is a machine, which is a mechanical or essential artificial agent. It is an electro-mechanical machine that is directed by a computer program or electronic circuitry. Drone and Robot are two terms, which are totally different from each other. Let us understand both the terms in the following context. The male of the honeybee and other bees, stingless and making no honey. An unmanned aircraft or ship that can navigate autonomously, without human control or beyond line of sight. (Loosely) any unmanned aircraft or ship that is guided remotely: a radio-controlled drone. A person who lives on the labor of others; parasitic loafer. Drone is commonly known as Unmanned Aerial Vehicle (UAV). It is an aircraft without a human pilot on plank. The vehicle is controlled automatically by computers, or it can also be operated by the remote control. The use of drones has grown quickly in recent years because unlike manned aircraft they can stay aloft for many hours. 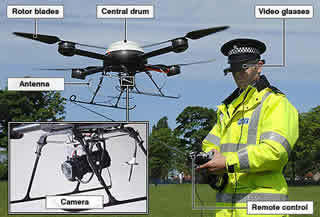 Compared to military aircraft, they are much cheaper; and are flown remotely so there is no danger to the flight crew. There are different types of armed and surveillance drones in Iraq and Afghanistan; the US have two separate ‘squardron’ of armed drones – one run by the US Air Force and one run by the CIA; the UK has several types of surveillance drones, the most popular is Watchkeeper, and many more drones are available in many other countries. Drone may also be used in many other context, as mentioned above in the Dictionary.com definition. A machine that resembles a human and does mechanical, routine tasks on command. A person who acts and responds in a mechanical, routine manner, usually subject to another's will; automaton. Any machine or mechanical device that operates automatically with humanlike skill. 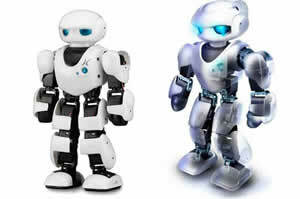 A robot is a machine, which is a mechanical or essential artificial agent. It is an electro-mechanical machine that is directed by a computer program or electronic circuitry. Robot is basically a system that contains sensors, control systems, manipulators, power supplies and software all working together to perform a task. There really is no standard definition for robot, but it is a type of electronic device that performs many tasks. They can be helpful in various activities, and can perform only those tasks which are installed in them. They are very costly as compared to drones; and will take hundreds of years to replace human warriors because of the cost, and technological advances needed to field them. Drones are semi-autonomous vehicles start on from larger spacecraft designed to expand the launching ship's capabilities. A robot is a machine, which is a mechanical or essential artificial agent. It is an electro-mechanical machine that is directed by a computer program or electronic circuitry. Old English drān, drǣn 'male bee', from a West Germanic verb meaning 'resound, boom'; related to Dutch dreunen 'to drone', German dröhnen 'to roar', and Swedish dröna 'to drowse'. From Czech, from robota 'forced labour'. The term was coined in K. Capek's play R.U.R. 'Rossum's Universal Robots' in 1920.